I would completely champion that. This is for passionate and informed, decisive teachers. It’s a step by step guide to approaching learning techniques as an art form and to encourage the students to see it that way, so demonstrating what an artful attitude can bring to life. Opens with a chapter on artful approaches to learning, I’m glad to see an encouragement to use our senses. We react to everything through our senses as well as our instinct. In a world of screen devices it’s easy to forget to use your senses and to give credit to them. The Artful Educator starts with a discussion into what creativity is in the context of teaching and questions the place of technique and discipline within creativity. These questions in themselves are massive subjects to undertake in one book. Yet all the time there are suggestions for how to implement this approach. Each section contains lists of great ideas and starting points. The importance of the imagination is what we are talking about here. Until you write that story – that story doesn’t exist yet. It needs to be brought into being. It exists only in the imagination into the skills of writing put it onto paper. The Artful Educator states that teaching artfully is about being able to the rise to challenge, to react, to take risks and to push boundaries. This book acknowledges where education has got to with an emphasis on a fact based curriculum and is championing teachers to lead with a new way of looking at education. If you were hoping to get away from it – no such luck. Being an artful educator still requires planning! . Planning is, of course, a vital part and this book contains ideas to get you thinking about how to start from non traditional starting points. So many suggestions and not necessarily from the point of knowing what learning outcomes need to be achieved at the end. Once you read into the second part of the book – the wealth and true creativity of Sue Cowley can really be appreciated. Is almost that the first half is trapped in the education system of what needs to be covered and said. Now we enter into real creativity. She outlines different roles that can be played in the classroom to extract the best learning situations for students. eg: the actor, the playwright, director , set designer, costume design er, storyteller, the author, the chef. Each chapter lists ways that you can bring a role to your students learning. Loads of ideas that are straightforward to replicate. It really is a great resource for that. Fantastic ideas. How to create paintings that assist your science lessons, how to use an art gallery for maths study, how to use authoring skills in a music lesson, be ‘Poetry man’ instead of a teacher for a day. In another life I think Sue Cowley would have been working in theatre. Having come from a career as a theatre designer myself I can absolutely understand the concepts she is putting across. It’s about immersion in the subject and how that communicates in a connected way to the student much more so than dry text books or worksheets. Teaching artfully in the context of this book does mean being a sort of installation performer. Open to chance and intuition. Going off script for a bit and being ok with how that turns out. I would consider myself an artist and ok with the creative process but the thought of going into a classroom of kids and then taking that journey, now that petrified me! But there are lots of ideas I want to try here. This book is a massive resource on how to shake things up in your classroom, to get yourself out of a rut you might be stuck in. Loads of examples of ideas to start from or incorporate into your ideas already. It has given me the inspiration to set up some workshops I’d been wanting to do but was avoiding. What is great is that The Artful Educator doesn’t just aim at primary level. Written with secondary teaching in mind too. Is it harder at secondary level to be more artful?, is there more resistance to ‘play’? It’s important to state here is that Sue Cowley is an experienced teacher, she knows her stuff and she knows the curriculum inside out. She lists relevant ideas that can be linked to the curriculum and will achieve the learning outcomes. For a teacher lots of the intellectual planning work is done here. Just filter them and take the leap. And to many teachers it may be a leap of faith but you start small. A teacher struggling with how to communicate their curriculum to their class will welcome such great inspirations. I’ll be honest. It’s a huge book in terms of what it is suggesting. I was worried it is too much and will put teachers off who are faced with rigorous expectations of test results from education bodies, it’s too ‘out there’ maybe. But the final short chapter addresses this. Start small . Ten Tiny Steps. Just like Kenny Pieper’s ‘Ten minutes a day’ in Reading for Pleasure. Small steps really do create change. Pace your “artful rebellion”. And it will be a rebellion so worth doing, I just know it. 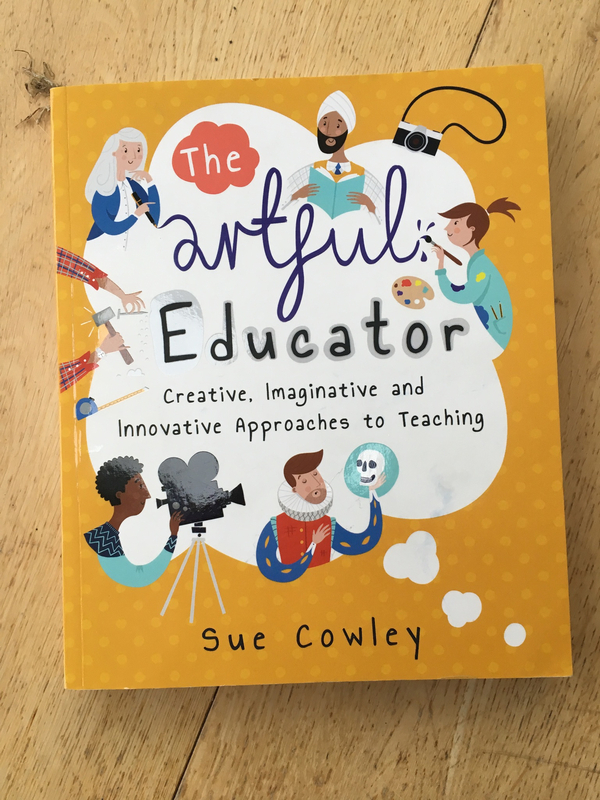 The Artful Educator by Sue Crowley. Crown House Publishing. The post is part of a series of book reviews on education. Trivium 21st Century by Martin Robinson, Reading for Pleasure by Kenny Pieper.